Temperature Control & Dual-voltage system. Wash your hair first: you will need to first wash your hair with a gentle shampoo to avoid stripping before applying heat over it. Use Luke-warm water to thoroughly rinse-out your hair. Condition your hair: consider applying a straightening conditioner to your hair in-order to make it feel smooth and hydrated. In fact, you may consider using a moisturizing conditioning shampoo to save time. Dry-out your hair with a towel: use a microfiber-towel to dry-up your hair after washing and conditioning it. 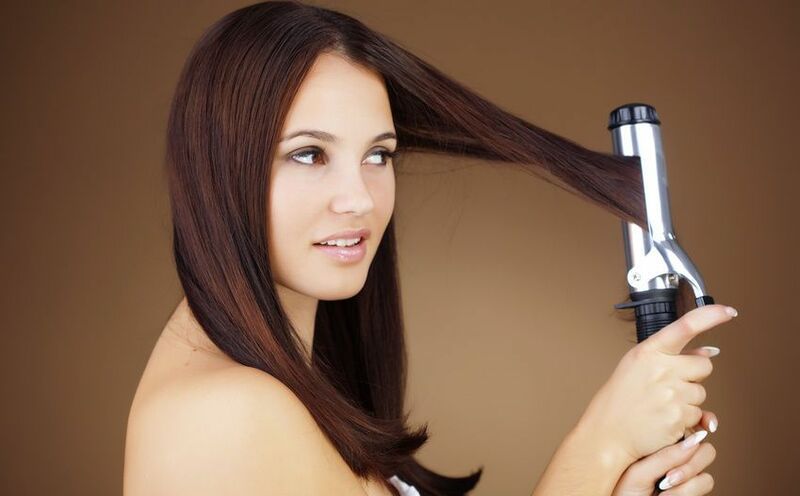 Make sure your hair feel a bit damp and then use a blow-dryer over it. Apply a heat-protectant: heat-protectants help to protect your natural-hair from heat produced by styling-tools like blow-dryers, flat-irons, etc. so, you apply a heat protectant to your hair and this can be in-form of a spray, lotion or cream. Brush your hair and divide it into sections: use a round hair-brush to comb through hair and afterwards divide it into small-sections in-order to facilitate for quick and easy hair-straightening. Heat-up the flat-iron and begin straightening hair: get a good flat-iron with variable heat-settings, switch it on and select the right heat-setting. After heating-up well, move the flat-iron over each section of hair starting at about a half-inch from the roots while moving downwards to the hair-tips. Finish by applying a hair-shine spray: after straightening-up all your hair, consider apply a silicone-based shine-spray to it in-order to give it a great glossy look. ERGONOMIC-BODY Yes with Curved Floating Plates. The CHI Air Expert is a Professional and advanced Ceramic-Tourmaline Ionic Flat-Iron designed to help you achieve fast hair-straightening results while leaving hair looking smooth and sleek. This flat-iron is equipped with a Temperature Control with adjustable temperatures from 180F-to-410F in order to provide you with optimum-control that is required to achieve a perfectly smooth and sleek look on all hair-types. Its ergonomic round body-shape design allows for easy flips and curling-styles so that you can always achieve the look you like while the 100% True Solid ceramic-tourmaline plates use advanced infrared heat-technology to heat-up in seconds at just the press of a power-button for about 3-seconds thus saving you a lot of time especially in rush-hours. Ceramic ionic-System: This professional flat-iron features a revolutionary ceramic-ionic system that helps to hydrate and add shine to hair when styling it perfect hence making it perfect for use on natural-hair. Temperature Control: The CHI Professional flat-iron is equipped with an advanced temperature-control dial that facilitate for quick and easy adjustments up to 410-degrees when styling your hair. 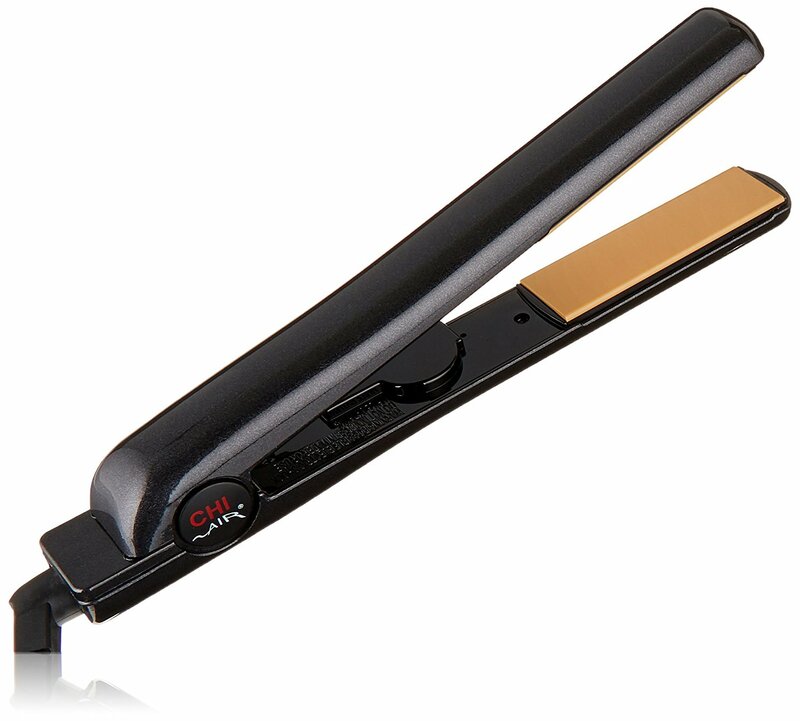 Solid Ceramic-Tourmaline Plates: The CHI Air Expert flat-iron features 100% true solid ceramic-tourmaline plates infused with ceramic to facilitate for quick heat-transfer and maximum durability. Adjustable temperature settings: it’s equipped with adjustable temperature settings ranging from 180F-to-410F to provide you with greater-control which is actually required to achieve a perfectly smooth and sleek look on all hair-types. Smart Infrared-Heat Technology: The CHI Air Expert flat-iron uses advanced smart infrared technology to get the plates hot in just seconds so you that don’t have to lose any time when styling your hair. So, you will just need to hold the power-button for 3-seconds and the plates will heat-up instantly. A Dual-voltage system: This Digital flat-iron features a dual voltage power-system that enables it to operate under different voltages ranging 120v-to-220v thus making it a perfect for use in any region around the world. This is a professional Titanium-Plated Ultra-Thin Straightening Iron that is extremely lightweight and easy to maneuver when styling hair. This flat-iron features extra-long 5-inch plates that can heat up to 450°F and facilitate for straightening of wider sections of hair faster and effectively hence reducing on hand-fatigue. Additionally, this flat-iron features a Nano Titanium coating on the plates which is actually a great heat-conductor that maintains consistent high-temperatures while producing negative-ions that help to keep your hair healthy and moist. The titanium plates also emit far-infrared heat that penetrates hair from within to facilitate for gentle hair straightening without causing damage while the sleek metallic-toned Ryton housing is designed to withstand ultra-high temperatures. Lastly its well-balanced, ergonomic-design facilitates for extra comfort when styling hair while the integrated ceramic-heaters help to instantly heat the flat-irons plates’ so as to reduce on styling time and fatigue. Negative-ionic Technology: The BaBylissPro is equipped with Nano Titanium plates which emit negative-ions that help to seal-in hair’s moisture into the shafts hence providing smooth and shiny hair without any heat-damage. Far-infrared Technology: The far-infrared heat produced by the Titanium-Plates penetrates hair from within in-order to facilitate for gentle hair-straightening without causing any damage. Nano Titanium-Plated: The BaBylissPro flat-iron features a Nano-titanium covering on the plates that allows for smooth gliding over hair without snagging. Adjustable temperature-levels: The BaBylissPro features 50 heat-settings that are adjustable up-to 450 degrees hence making it a perfect tool for use on all hair-types. 5-inch extended plates: it also features extended 5-inch plates that can heat up-to 450°F and allow for straightening of wider-sections of hair in less time thus eliminating hand-fatigue. Ceramic heater: The integrated ceramic-heater facilitates for instant heat and recovery in-order to help you reduce on styling time most especially in the rushing-hours. Ryton Housing: The BaBylissPro has a sleek metallic-toned Ryton housing that doesn’t heat-up too much when using the flat-iron to style your hair thus providing you with optimum styling-comfort. The Croc Classic is a professional Flat-iron equipped with Nano-silver technology that facilitates for sterilization and deodorization for hair while the integrated ionic-plates use far-infrared heat to provide you with smooth cuticles and shiny hair at all times. This flat-iron also features a digital temperature-control with over 25 heat-settings ranging from 200F-to-450F in increments of 10F in-order to provide you with the best hair-straightening results while the integrated FND digital-display and digital temperature-control systems help to maintain the precise temperature at all heat-levels. Additionally, the Croc Classic flat-iron uses the most advanced ceramic technology to facilitate for more effective hair-straightening and 60% faster hair-styling results. Lastly, the auto shutoff feature helps to automatically switch-off the flat-iron just after a few minutes of non-use thus making it very safe to use at home. Titanium ionic-plates: This Straightener features 1.5-inch titanium-ionic plates that are very smooth and can glide effortlessly over natural-hair to provide you with great styling results. Nano-silver Technology: The integrated advanced Nano-silver technology helps to sterilize and deodorize hair-locks keeping your hair looking healthy and in shape at all times. Advanced ceramic technology: The Turboion Croc Classic flat-iron uses advanced ceramic technology to straighten hair and to lock-in moisture thus keeping hair looking shiny and healthy. FND Digital-display & Temperature-Control: This flat-iron features an advanced FND digital display and digital temperature-control system that helps to maintain precise temperature at all heat-levels making this flat-iron perfect for use on different hair-types. 25 custom temperature-setting: The Turboion Croc Classic flat-iron also features fully-digital, 25 custom temperature-setting ranging from 200F-to-450F in increments of 10F. Ceramic heaters: The integrated ceramic-heaters help to provide instant heat so that you don’t have to waste your time waiting for the plates to heat-up. The Karmin G3 is a Salon-Professional, Ceramic and 1-inch Flat-Iron that is equipped with a flash quick heating function that helps to heat-up plates under 30-seconds hence facilitating for fast hair-straightening results most especially in the morning when hurrying. In fact, this flat-iron looks sleek and stylish with a streamlined exterior and solid black ceramic-plates covered with tourmaline giving it an ultimately smooth finish. In fact, the ceramic surface of the plates facilitates for heat-conduction and ultra-consistency in-order to help you achieve very smooth hair while conserving moisture. The Karmin G3 flat-iron also uses micro-porous technology and infrared heat to straighten and smoothen your whereby the infrared-heat fights positive-ions which cause frizz while micro-porous technology keeps the dips and dents so small that they don’t disrupt your hair’s smooth surface. Lastly, this flat-ion also features adjustable temperature settings up-to 410 degrees in-order to allow you get a desired hairstyle at any given heat-level while the integrated tangle-free swivel-cord facilitates ensures optimum convenience when straightening hair. Tourmaline-Ceramic Plates: the Karmin G3 features pure ceramic-plates covered with tourmaline-crystals to ensure great heat-conduction and ultra-consistency required to achieve super-smooth hair while locking-in moisture hence keeping your hair shiny, smooth and healthy all-day. Micro-Porous Technology and Infrared: The Karmin G3 flat-iron uses micro-porous technology and infrared-heat to straighten-up your hair. In fact, the infrared-heat produces negative-ions that help to eliminate hair-frizz while micro-porous technology helps to keep dents and dips very small in-order to help you achieve very smooth results. 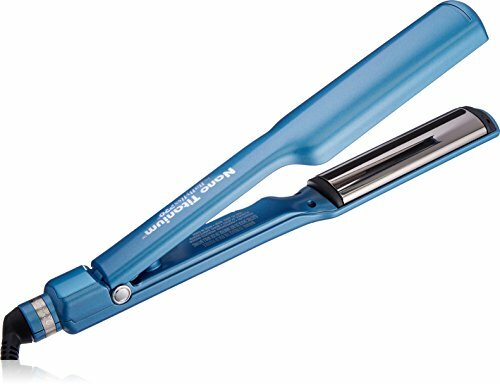 Adjustable heat-controller: this flat-iron also features an advanced heat-controller that allows you to adjust its heat-levels up-to 410-degrees. However, it’s not recommended to go over 400-degrees when styling your hair because heat may damage your natural-hair. Dual-Voltage Settings: The Karmin G3 features dual-voltage settings ranging from 110v to 220v. This implies that you will be able to carry this hair-Straightener with you when traveling to any part of the world so that you can continue achieving your desired hairstyle. Ergonomic and Stylish Design: The Karmin G3 features a sleek, stylish and streamlined exterior that is available in different colors but with the same solid-black Ceramic-Plates interior. In fact, this flat-iron is feels very comfortable to hold in the hands and even features tangle-free swivel cord. 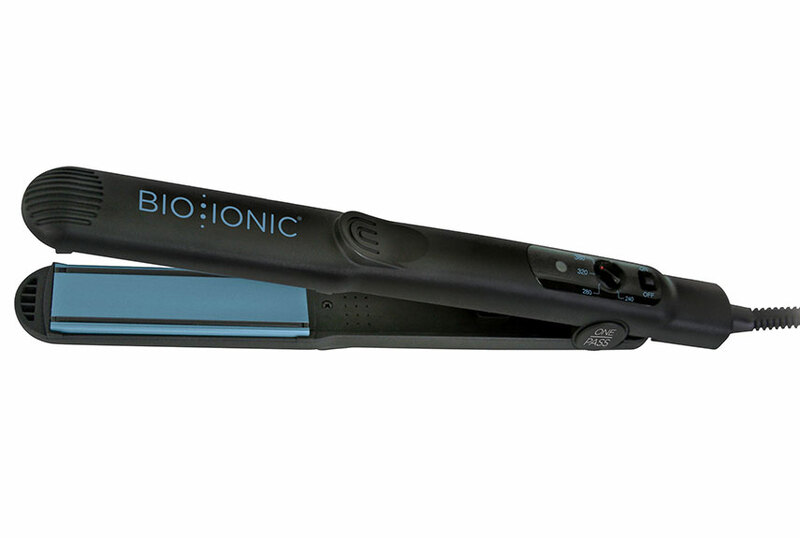 BIO IONIC Onepass is advanced Straightening-Iron that has been equipped with silicone-speed strips that provide faster straightening and increased shine while the high-levels of negative-ions and far-infrared energy it produces provide your hair with a silky, smooth and conditioned look. On the other hand, the integrated Nonionic mineral helps to hydrate dry and damaged hair while smoothening fly-always and controlling frizz hence giving your hair great shine and brilliance. additionally, this professional flat-iron features a BioCeramic-heaters that help to heat-up the plates up to 400-degrees Fahrenheit with instant recovery for smooth results from the hair roots to ends while the multi-level heat controller for precise temperature setting while the 9 ft Swivel-Cord makes this flat-iron very convenient to use when styling your hair. BioCeramic heaters: The integrated BioCeramic heaters help to heat-up the OnePass flat-iron up to 400-Degrees Fahrenheit with instant recovery in-order to facilitate for smooth results from the hair roots to ends. Negative-ions and Far-infrared energy: The OnePass Flat-Iron plates emit natural negative-ions and far-infrared energy that break down water clusters on hair-surface into smaller molecules that penetrate deeper hence hydrating hair while removing frizzies and creating healthy-looking shiny-hair. Multi-level heat controller: There are several heat-levels on this flat-iron that can be easily adjusted using the integrated heat-controller. In fact, heat-levels are adjustable up-to 400 degrees without a lot of waiting-time. Patented Silicone Speed-Strips: With the patented silicone speed-strips in the plates, this flat-iron will allow users to straighten and style hair smoothly in half the time when compared to other flat-irons on the market. Ergonomic-Design: This Flat-iron features a sleek exterior that is extra-durable and an easy-to-grip handle that facilitates for easy maneuvering and optimum-comfort when straightening hair. CONCLUSION: All the flat-irons and hair-straighteners featured in above have been fully tested and reviewed in-order to provide you with high performance results when styling your naturally long to medium hair in 2019.